In fragile settings—countries in conflict or crisis—scaling up healthcare is increasingly complex, yet incredibly urgent. Maternal mortality in fragile states is almost quadruple that of other low- and middle-income countries, and infant mortality is double. And 60 percent of the countries with the highest maternal and neonatal mortality rates are classified as fragile, conflict, and violence impacted by the World Bank. 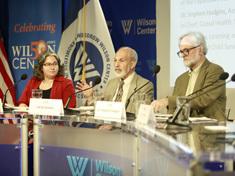 Understanding the context in fragile states is key, said Cooley. “Governments and markets”—the two main platforms for scaling up health interventions—“are both compromised.” Interventions and programs are often politicized along battle lines. Countries experiencing conflict or instability often cannot rely on public financing, and international support is inconsistent. “Resources tend to flow in very quickly around a crisis,” said Cooley, “and they flow out equally quickly.” Consequently, financing organizations such as the Global Financing Facility (GFF) invest in non-governmental organizations and humanitarian aid programs to secure stable ground. Most importantly, scaling up in fragile settings requires a heavy focus on the system, and not the details of the intervention in and of itself. “We need to be giving appropriate attention to the system that is going to have to deliver that intervention,” said Dr. Stephen Hodgins, associate professor for Global Health at the University of Alberta and editor-in-chief of Global Health: Science and Practice. This audio was recorded at an event at the Wilson Center on May 16, 2018.